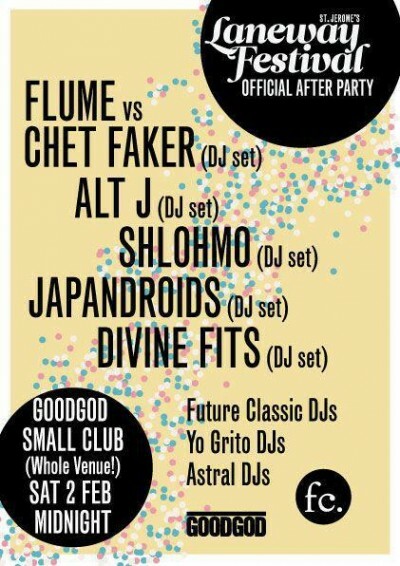 GOODGOD Small Club ~ LANEWAY FESTIVAL TAKE OVER GOODGOD! LANEWAY FESTIVAL TAKE OVER GOODGOD! This Saturday, access to our front bar will carry a cover charge of $15 from midnight as it is part of the full venue Laneway afterparty. With Laneway Festival completely sold out in Sydney, we’ve teamed up with Future Classic to present some super special one-off DJ sets from Laneway artists. Check out this ginormous line-up! No presales, just $15 on the front door from midnight. For more info, check out our event page.